1. 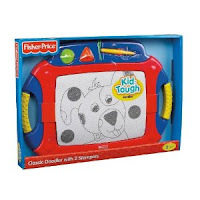 Fisher-Price Classic Doodler (Magna Doodle) - Here's a toy that will satisfy your child's creative side, as well as keep you (the parent) happy due to its portability and the fact that it's noise-free. 2. Mega Bloks 200-Piece Duffle Bag - While some 3-year-olds are ready for the smaller sized Legos, many younger 3's will have an easier time building with the larger Mega Blocks. 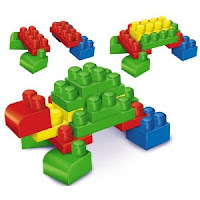 They're similar to Lego's Duplos, but cheaper! 3. Pretend Food - There are dozens of companies that offer make-believe food of varying quality, but you really can't go wrong with any of the Melissa & Doug products. There are wooden fruit cutting sets, pizza sets, an ice cream parlor, and more. 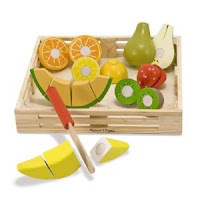 Some are wooden, some are plastic, all are high quality and loads of fun for the 3-year-old who loves to play in the kitchen. 4. A Tricycle - Most 3-year-olds aren't quite ready for a bike, but have long lost interest in the ride-on toys of their youth. 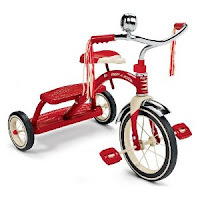 A tricycle is an excellent transitional bike and come in various sizes. We like the Radio Flyer Classic Red Trike. 5. Classic Board Games - Congratulations! 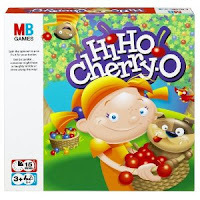 Your child is finally ready for board game greats like Candy Land, Chutes and Ladders, Hi-Ho Cherry-O and other fun family games. Enjoy -- your days of peek-a-boo are over!